which was completely refurbished in 2015 with new units and appliances throughout, including the Green Room. 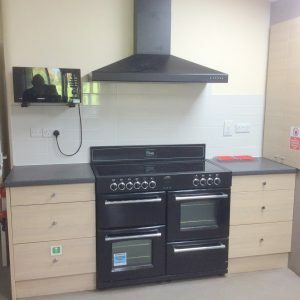 The Main Kitchen now contains an electric, double-oven range and grill with a 7-ring ceramic hob and extractor hood, a commercial dishwasher for rapid washing up, a full-height fridge-freezer and a microwave oven. 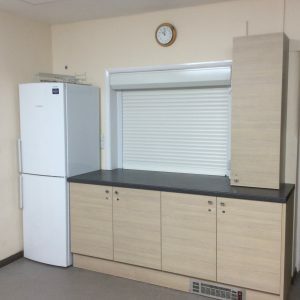 There are several work surfaces for preparation and serving, the usual sink and drainer, and separate hand-washing facilities. A serving hatch with an electrically operated shutter provides easy access to the Main Hall. There is independent doorway access to the Main Hall, the Green Room and, via a corridor, the Committee Room. Details of crockery and glasses available to hire can be found here.